Looking for a quick and healthy dinner to put on the table tonight? 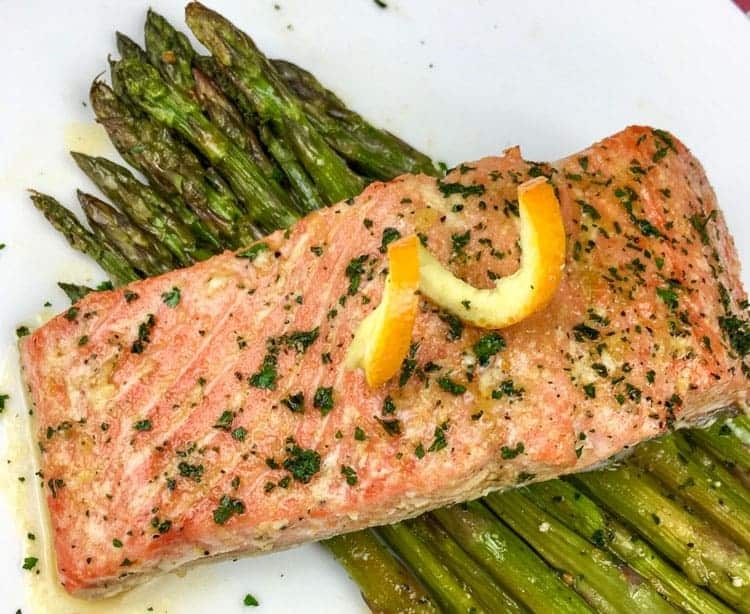 Orange-Glazed Salmon with Asparagus is just what you need! We all have them: the days when absolutely nothing gets done on schedule. Your alarm doesn’t go off, you can’t find your car keys, a one-hour meeting turns into a two-hour meeting, you get stuck in traffic… before you know it, it’s almost dinnertime and you’re starving. But you really, really don’t want to order a pizza or take-out. You want a healthy, satisfying meal filled with nutritious sources of protein, carbs, and fat that won’t leave you feeling weighed down. You could call this Orange-Glazed Salmon with Asparagus recipe “healthy fast food.” It’s done in under 25 minutes and is loaded with nutritious Omega-3s (from the salmon) and Vitamin K (from the asparagus) among other valuable nutrients. It has plenty of healthy fat to keep you satisfied, and the generous serving of asparagus will help boost your green veggie intake for the day. 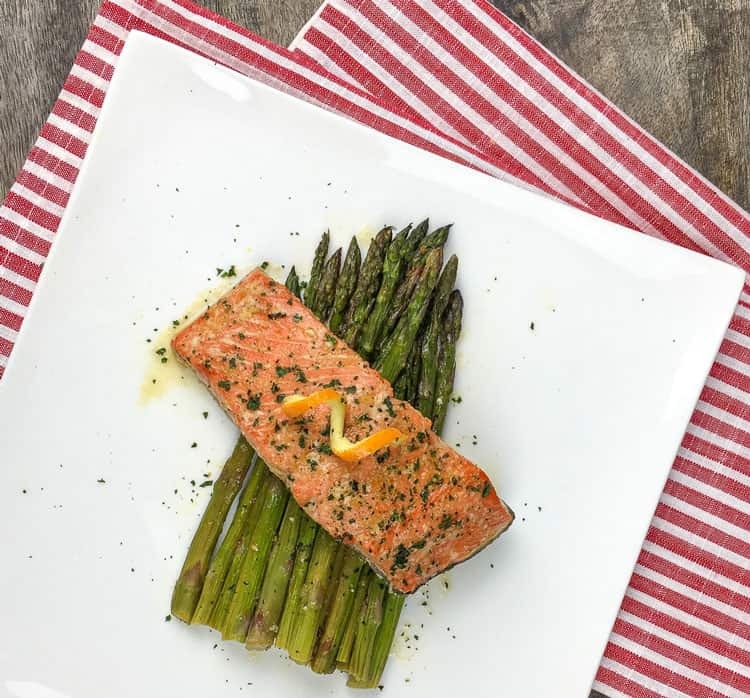 The orange glaze on this salmon is made from a small amount of orange juice (3 tbsp) and honey (2 tsp) that lends a wonderful orange-y, sweet flavor without weighing it down with a lot of added sugar like some orange glazes. It’s just sweet enough without being overly sweet. Why Use Wild-Caught Alaskan Salmon in This Orange-Glazed Salmon Recipe? It’s completely natural. It doesn’t have any added dyes (sometimes dye is added to farmed salmon to make the color brighter! ), preservatives, or other additives. They consume a natural diet. Unlike grain-fed farmed salmon, wild-caught salmon eat an entirely natural diet. If you can, go for wild-caught salmon. Step #2: Whisk together orange juice, honey, olive oil, balsamic vinegar, and garlic. Season with salt and pepper to taste, and brush the mixture over the salmon fillets. Step #3: To the same bowl you prepared the orange juice mixture, add the asparagus. Toss to combine, and again season with salt and pepper to taste. 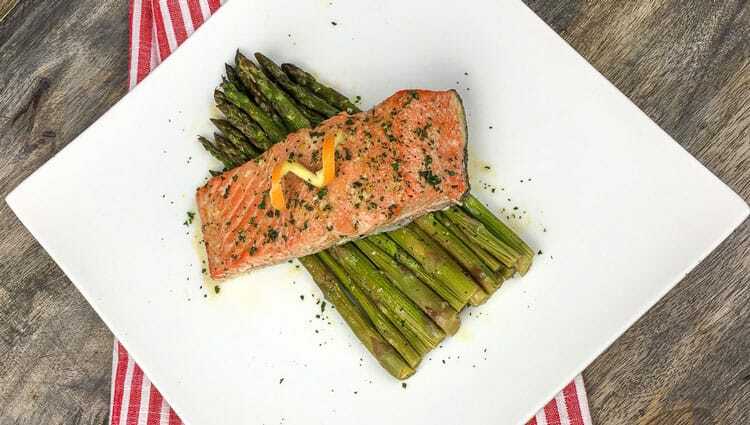 Step #4: On the baking sheet, arrange salmon fillets and asparagus in a single layer. Place in pre-heated oven and bake for 15-18 minutes. Salmon should be flaky and the asparagus will develop a bit of color. Be careful not to overcook the salmon. This is a wonderful one-pan dinner ready in under 25 minutes! Preheat oven to 400°F. Line a large, rimmed baking sheet with a silicone baking mat. Place the salmon skin-side down in the center of the baking sheet, then set the baking sheet aside. Add asparagus to the same bowl. Gently toss to coat the asparagus with the remaining orange juice mixture. Season with salt and pepper to taste.